Bidgely Introduces Groundbreaking Energy Analytics Platform, Providing Appliance-Level Itemization and Insights to Utilities and their Smart Meter Residential Customers; Announces $3M Series A Investment from Khosla Ventures. It's a fundamental change in the way people receive their energy information enabling them to make informed decisions," says Vinod Khosla. Bidgely today announced commercial availability of its energy analytics platform, and a Series A investment of $3M from Khosla Ventures. Bidgely’s platform provides appliance-level itemization of electric bills that uniquely enables utilities to engage their residential consumers with specific and actionable insights, recommendations, and savings on their energy bills. The first-of-its-kind recommendations engine uses big data algorithms that disaggregate energy usage and mash up itemized appliance level insights with individual social and behavioral profiles of users. Notable in its non-intrusive, software-based approach, Bidgely’s platform solely relies on already installed utility smart meters and standards-based home area network gateways. “Residential energy efficiency is a large untapped source of energy and Bidgely realizes this with their disruptive disaggregation technology. Consumers can see their itemized energy usage per appliance - similar to their phone or credit card bills. It’s a fundamental change in the way people receive their energy information enabling them to make informed decisions,” says Vinod Khosla, Founding Partner at Khosla Ventures. Research published by ACEEE and others has shown that 4-12% household energy savings can be achieved across a large number of homes with analytics similar to that available from Bidgely (compared to 1-2% that current programs deliver). “We are facing several looming energy problems at this junction in history. First, significant low-cost energy reductions can be made in the residential sector, but these savings have not been achievable to date. Second, billions of dollars are being spent to install Smart Meters, yet the energy saving and financial benefits of this infrastructure – without careful consideration of the human element – will not reach its full potential. These problems can be addressed by strategically marrying them, using Energy Disaggregation,” says Carrie Armel at Stanford’s Precourt Energy Efficiency Center (PEEC). Bidgely is collaborating with Stanford PEEC to unlock the residential energy efficiency using disaggregation technology and behavior sciences research. The first commercially available product from Bidgely analyzes Smart Meter data collected through the Home Area Network (HAN). Future products will analyze the 15 minutes or 1 hour interval Smart Meter data collected through Utility Advanced Metering Infrastructure (AMI) network. Besides being available as a ground-breaking consumer engagement solution for utilities, the Bidgely platform can be directly used by consumers who have access to their whole house energy consumption data either through ZigBee HAN gateways or Do-It-Yourself energy monitors. Please visit our website to learn about how to get started: http://www.bidgely.com/getstarted. Consumers, who do not want to invest in a hardware device yet, will soon be able to use Bidgely analytics with their Green Button data available from the AMI network of the participating utilities. Bidgely has partnered with several manufacturers of internet connected ZigBee HAN gateways that communicate with Smart Meters in real time and upload the data to Bidgely platform for a seamless consumer experience. The solution is compatible with ZigBee SEP/1.x standard and is being tested by several utilities across the world. A list of Bidgely partners is available at: http://www.bidgely.com/partners. Bidgely’s goal is to better engage residential consumers and empower them to take control of their energy spend without sacrificing comfort. 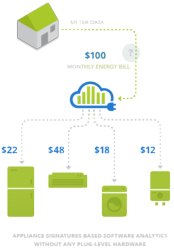 Bidgely’s cloud based bill itemization technology is designed to learn and analyze energy data from millions of homes and generate appliance level insights for consumers. Bidgely’s web and mobile apps not only eliminate the need for a dedicated in-home display screen in the house, but also make it convenient for consumers to access their information and receive real time alerts whether at home or outside. Incorporated in January 2011 and privately held, Bidgely is headquartered in the Silicon Valley.